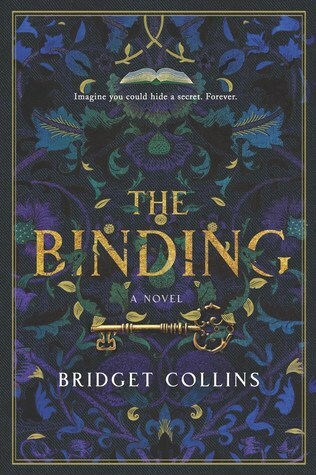 The Binding by Bridget Collins was an okay book, but it could have been better. In its defense, I confess I probably would have enjoyed this a lot more if my patience threshold hadn’t been so low when I started this; I’ve had a recent run of bad to mediocre reads lately which has made me extremely finicky, and unfortunately, there are many things about this one that make it a very mood-dependent book. But first, I did love the novel’s concept. I’ve always had a thing for “books about books”, and I thought The Binding deserves points for tackling the idea quite a bit differently. That’s because books in this world are nothing like the way we think of them, neither for knowledge or for pleasure. Instead, they are magical devices handcrafted by specially trained artisans called Bookbinders, who use books as vessels to take away and store a person’s worst memories. All the secrets and the pain and hurt and guilt that one can’t bear to live with, a Bookbinder has the mysterious power to erase and lock away, which has resulted in much fear and mistrust around the profession, and not surprisingly, books themselves are anathema and forbidden. This was a lesson protagonist Emmett Farmer learned early on, when he was a young boy punished by his father for bringing home a book from the Wakening Fair, not understanding the gravity of what he’d done. But for as long as he can remember, Emmett has always been drawn to books, and soon enough, we get to learn why. What he’s always thought of as a debilitating condition which has prevented him from working efficiently in his family’s fields actually turns out to be a sign of his potential to become a Bookbinder. Before long, a letter arrives from an elderly Bookbinder named Seredith with a demand for his apprenticeship, and despite his reluctance to leave the farm, Emmett knows deep in his heart that he has no choice. Under Seredith’s tutelage, Emmett learns the delicate art of binding. He also discovers the truth behind the books she creates, watching as customers arrive at her doorstep, beseeching the old Bookbinder to take away their memories and lock them up. But not everything is as they seem either. Soon, we get to see that the business of bookbinding is rife for abuse, with some engaging in the illegal trading of books while others misuse the services for their own nefarious purposes. Which brings us to Lucian, a wealthy young patron who visits Seredith’s shop one day. We won’t find out how until much later, but Emmett and Lucian’s lives are connected in some way, and in time we learn how a great disservice has been done to them both. I have to say, The Binding was a deeply layered book. Again, I suspect that I would have enjoyed it a lot more had I had been in a better mood for a story like this, but there was also plenty about its execution I found aggravating. For one thing, the book is told in three parts, with some accompanying perspective and time shifts that I didn’t feel were written all that effectively. I liked the first part well enough, mostly due to Collins’ amazing characterization of both Emmett and Seredith, as well as the development of their master-apprentice relationship. This section also introduced a world of mystery that I found very enticing, making it hard to resist reading more. But then came the second act, told via a flashback. Emotionally, I found it challenging to connect with this section—very unfortunate, considering how so much of what was covered here would play directly into the crux of the novel, revealed in the third and final act. My enthusiasm already dampened at this point, my apathy only increased as we shift POVs for this concluding section, which felt a world away from the magic and allure of the first act. Instead, we mostly got a lot of drama and anguish. I don’t want to spoil things too much, even though many of the reviews have already mentioned the queer romance and the tale of star-crossed lovers (though honestly, it’s quite obvious that the book was setting up for it), but essentially, I felt this last act failed to deliver the emotional intensity such crucial dissemination of events required, or it’s possible I just felt too disconnected from the POV to feel much of it. My final verdict? I really thought I would love The Binding, given its fantastic premise. However, I struggled miserably with the shifts between the novel’s three parts, and as such, things did not go as smoothly as I would have liked. On a better day, I might have felt a little more magnanimous, but lately I’ve been burned by too many books that show early promise only to fizzle out by the end, and I was disappointed when this one followed the same trend. In all fairness, this wasn’t a bad book, but I do wish it had been more emotionally satisfying. Aw, I feel your pain! It’s the worst when that happens because you go from excited to so disappointed! Lovely review as usual, Mogsy. 🙂 I have read some very good reviews about this book. So reading yours was a surprise. However, I totally get your reasons. I enjoyed this one more than you – but, it felt like a book with three parts, and not all of them were equal. I enjoyed the first part very much. The second part took me by surprise but I still liked it. The third part felt out of place somehow, almost like it was a different story’s ending just tacked on – it didn’t fit, for me. I still liked it and had a good time reading it but I’ve been struggling with a review and also deciding between 3.5 and 4 stars. Ooh, shame, ‘cos I thought the premise sounded great too. I’ll still get to this, I think, but… meh. Definitely still give it a look if you’re interested! Others liked this more than me, and maybe I would have enjoyed it more too if I had been in a better mood! I’m sad to hear this didn’t work for you. I have a copy I need to get to, and I’m curious to see how those three parts fit (or don’t fit) together. Definitely complicated. I wasn’t sure what to make of the three very different parts. This recent run of “meh” books has indeed left its mark on you, and I understand how it might color your view of a less appreciable story. Maybe some… comfort reading – the booking equivalent of comfort food 😀 – might prove helpful in getting out of this unwelcome mood? A string of “meh” books is the worst – it’s the tedium that wears you down! Wow, this one completely skipped my radar! I have to say, the premise is absolutely fascinating. Too bad you weren’t quite in the mood for it (but thanks for saying that up front)! The premise was absolutely fantastic! It’s what attracted me to the book, after all. It’s just too bad I wasn’t crazy about the execution! I think that was the case too. Sometimes the very nature of a book’s premise can work against it. This book sounds really interesting! But I can see why you struggled!